Before doing this examination of Brazil, my understanding of the country and its people was rather superficial. Carnival. Soccer. The Amazon. Rainforests. Actually, I knew a little more than that. Its diversity was one of the characteristics that attracted me to learning more about Brazil. I have acquired a more multilayered understanding of Brazil after having completed my research, and in particular after talking to Claudia Costabile (personal communication, October 27, 2012). One of the most thought-provoking aspects of Brazilian culture has to do with its racial dynamic. Claudia Costabile described how tolerant Brazilians are, and that one cannot really know by looking at someone what their racial and cultural background is. She stated that people usually are of two or three ethnic or racial descents. The divide among people is more along economic lines than strictly racial ones. In the United States, racial relations between whites and African Americans took a course where discrimination and prejudice were based more on a strict definition of black and white (the "one drop rule"), and was played out in policies and laws such as segregation and a prohibtion on miscegenation. Despite a common history of slavery followed by abolition, the racial landscape looks somewhat different. Why that is still has me thinking. Margolis, et al. (2001) surmises that there is racial tension, but it is more subtle than in America. It is a topic that perhaps I would like to explore further. The most rewarding aspect of the project was the opportunity to interview Claudia Costabile and gain some of her firsthand perspectives. We sat on our deck at our weekend house in Anne Arundel County for several hours on a beautiful Saturday afternoon, the weekend before Hurricane Sandy. While most of the time spent was with Claudia, her husband Milton Maciel was also there. He is also Brazilian and added some of his views to our conversation. They both shared what they miss about Brazil after having lived in the U.S. for 10 years. For Claudia, it is her family and the style of family relationships in Brazil. For Milton, he states that he finds work relationships here in the U.S. to be very cold. People are less ambitious and competitive in the workplace in Brazil. Milton realizes that competition leads to progress, but overall, he finds Brazilians, particularly in the workplace, to be a warmer people. Delving deeper into Brazilian culture brought to the fore that realization that there are commonalities among people everywhere, and yet there are differences too. That may sound simplistic, but for intercultural communication, the key seems to be in the ability to celebrate our similarities, while also seeking to understand and appreciate the new and fresh aspects of a culture unlike our own in a non-judgmental way. In talking to Claudia, I experienced moments of connection when she described the immigrant feeling of not being quite American or Brazilian. With my parents' immigrant background, I understood that concept. On the other hand, I found it quite compelling to hear about the ways Brazil is different from the U.S.--its vibrant traditions, food and the diversity of its people. In this one on one encounter, I gained a richer picture of life in Brazil--in other words, "Other-knowledge"--from a firsthand source. I also found myself curious to learn more about this complex culture, for while I have certainly learned a lot while completing this project, it is clear there is much more to dig into. Traveling to Brazil would be one way to deepen my knowledge. While I have focused on traveling to Europe in the past, Brazil now holds a lure for me as well. 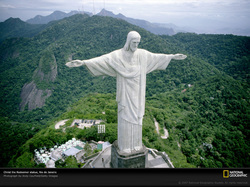 In closing, the statue of Christ the Redeemer in Rio de Janeiro is a fitting icon for Brazil. Of course, it is a Christian symbol which is appropriate given the country's predominant Catholicism. But also with Christ's outstretched arms, it symbolizes the warm welcoming attitude of the Brazilian people, ready to show a stranger the country they love and call home.